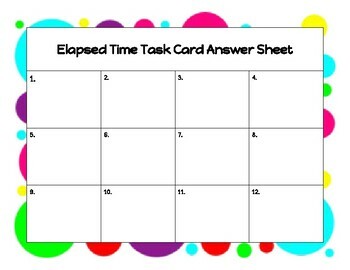 This set of elapsed time task cards has a colorful and cute polka-dot theme. 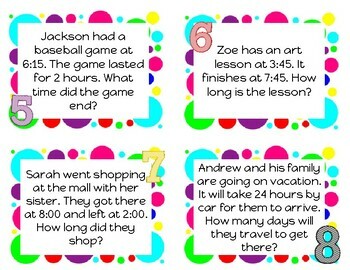 The questions on the cards cover 3rd Grade VA SOL 3.9b. 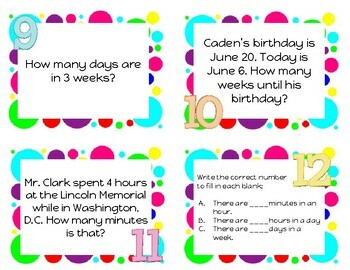 Task cards can be used for many different uses within the classroom or home school setting. In my classroom, I have used them for review, classroom or hallway scavenger hunts, generic game board questions, and SCOOT activities. They are very flexible! 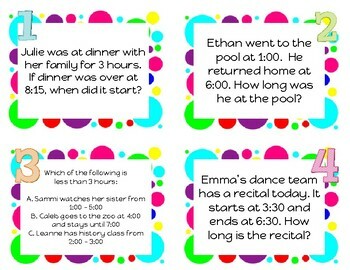 I have included a student response sheet and answer key for your convenience. Thanks for taking a look and feel free to ask any questions you might have.